The Conservative corporate-friendly group funded in part by the Koch brothers and responsible for the infamous Stand Your Ground and Voter Suppression ID laws, and a slew of other corporate-friendly laws, now doesn't want you to know about the food that you're eating. The way they come up with all this is that a couple of times a year they get corporate lobbyists and executives together in a fancy hotel or resort with mostly Republican state representatives and state senators. The ratio is roughly one-to-one of lobbyists to elected officials. And several states already have laws similar to what ALEC is currently pushing. Utah has a law that bans unauthorized photography in farms, and Iowa has a law that makes it a crime to lie to gain access to a farm's staff. But despite what ALEC may argue, Americans should have an absolute right to know what's happening to the food they eat. Take chickens and eggs for instance. When most Americans eat a chicken's egg, they don't think twice about where it came from. Or, if they do, they think of the egg coming from a chicken that could mosey around a farm, with free reign to move whenever they wanted to. Unfortunately, this idealistic view of a chicken farm is the exception, and not the norm. In reality, according to People for the Ethical Treatment of Animals, chickens are arguably the most abused animal in the world. In the United States alone, more than 7 billion chickens are killed for their flesh each year, while 452 million hens are used for their eggs. Nearly 99 percent of these chickens spend their lives in total confinement, from birth until death. Chickens raised on factory farms in the U.S never have a chance to do what comes naturally to them, like taking dust baths, resting in the sun, and building nests. And baby chicks born on factory farms are never allowed contact with their mothers. Chickens raised for meat spend their entire lives in dirty sheds with tens of thousands of other birds, and as a result, the intense crowding and close conditions often lead to outbreaks of disease. These animals are bred and drugged to grow so large that their legs and organs can't keep up with the growth, making heart attacks, organ failure, and growth deformities quite common. And those chickens used to lay eggs, called laying hens by the agriculture industry, have lives that are just as bad. Laying hens are crammed together in wire cages, where there's not enough room to move and spread out, and because the hens are so close together, they are forced to urinate and defecate on one another. 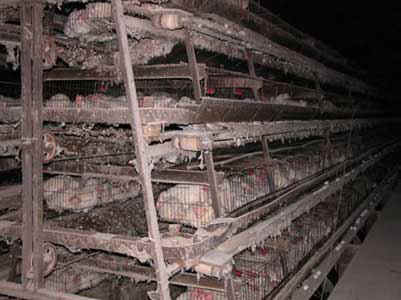 In fact, hens are kept in cages above large manure pits, and the cages are stacked so high that excrement from birds in higher cages often falls on those below, who then eat it. For chickens on the second and third layer down, the chicken poop from above has some nutritional value, because chickens don't have 100 percent efficient digestive systems – something that some chicken factory farms know and use to save money. Why feed a chicken food when it's cheaper to have it eat the poop of the chicken above it? The important thing to realize is that these are not wildly abnormal practices when it comes to factory farming in the United States, whether we're talking about chickens, cows, or pigs. Like the rest of corporate America, Big Agriculture's primary concern is with profit, and everything else comes second, including treating animals with dignity and respect. And it's because of these injustices that are taking place each and every day that animal activists do what they do, and take the graphic photos and video that they take. We have a right to know where our food has come from, and what it looks like. It's time to knock down ALEC's factory-farm abuse cover-up efforts, so every American can see the truth – and the pain – behind the food they eat.